David Glenn of The Glenn Law Firm can handle your burn injury case. Burn injuries are especially painful and difficult to treat. If you or someone close to you has suffered a burn injury due to the carelessness or wrongdoing of another, it is important to consult with a personal injury lawyer with the experience to handle these difficult cases. At the Glenn Law Firm, we understand the hardships you face and we can help. Attorney David Glenn has decades of experience helping victims of severe burns and other catastrophic injuries. He is prepared to help you pursue maximum compensation for your medical bills, wage loss, pain and suffering, and other hardships. In addition to burn injuries, our clients often suffer smoke inhalation injuries that can be life-threatening in themselves. 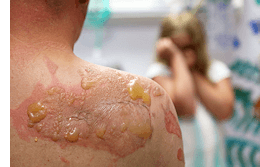 Burn injury treatment is painful and expensive. Burn injury victims often require multiple surgeries, skin grafts, physical therapy, pain medication and other needs for years, even a lifetime. A burn injury is devastating, but there is hope for financial relief. David Glenn is an accomplished personal injury lawyer who has helped numerous clients obtain outstanding results in cases involving severe burns and other catastrophic injuries. Contact The Glenn Law Firm To Discuss Your Burn Injury Case. We handle burn injury cases for clients throughout the Dallas-Fort Worth metropolitan area, across Texas and nationwide. Call us today at 817-424-5999 or contact us online to arrange a free consultation with an experienced burn injury attorney.